It's coming, but what will it bring? It's seems almost certain that Apple will reveal the next version of its mobile platform at its developer conference later today. Some eager beavers down in San Francisco have managed to snap some banners from outside of the Moscone West centre, Apple's location for its WWDC 2012 event. The images, first leaked to Macstories, with better resolution images shot by T3, show banners clearly displaying the iOS 6 branding, with the tag line "The world's most advanced mobile operating system." It's an unsurprisingly bold statement from the Cupertino-based outfit, which is certainly not backwards at coming forwards. We're still in the dark over what iOS 6 will bring to iPhones and iPads, but early reports suggest that the first generation iPad will miss out on the upgrade. The same report does claim that the iPhone 3GS will get iOS 6, even though some people thought that iOS 5 would be the end of the line for the aging handset. 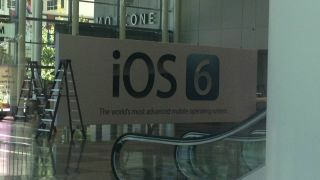 Find out what may be arriving in Apple's latest software upgrade in our iOS 6 release date, news and rumours article. TechRadar will be reporting on all the goings on at WWDC live as it happens from 10am PST (6pm in the UK), so stay tuned for the full low down.